Free Radicals is THUMP's new column dedicated to experimental electronic music. Each month, we take a look at the trends emerging from the frayed fringes of the dancefloor and why they're meaningful. In the 1940s, French composer Pierre Schaeffer invented musique concrète by stitching together field recordings of trains and found-sound speech with more traditionally "musical" passages. His grandiose collagist recordings would cause a paradigm shift in the way music as a whole was understood, demonstrating that there was compositional merit in the raw sounds of children's toys, kitchen instruments, and other domestic objects—symphonies just under the surface of the everyday. Over the past 70 years, the ideas that Schaeffer pioneered—essentially, that samples could be shifted and arranged as instruments in their own right—have become the default for those working within electronic music. In the past month alone, a crop of records released in various corners of the experimental sphere demonstrate that, more than an academic exercise, concrète can be a window into processing the street-level noise we hear each day. Just think about the din of your morning commute: there's the hum of a car, bus, or train; the fractured chatter of a radio station or other miserable worker bees inbound on public transit. We're surrounded by these vast soundscapes, and yet we never really think much of them. But concrète has the ability to zero in on minute details and find messages buried in the muck. From the washing machine-sourced glee of Matmos' Ultimate Care II, to the soaring vocal drones and quivering samples of Good Willsmith's Things Our Bodies Used to Have, to the shuddering household sounds of Wanda Group's Ornate Circular, the collagist approach of our concrète forebears can open up a surprising spectrum of emotions. In the sounds we encounter on a day-to-day basis—splashing water, creaking floorboards, chattering voices, the thrum of mechanized cleaning equipment—there's both terror and bliss. Maybe even transcendence. 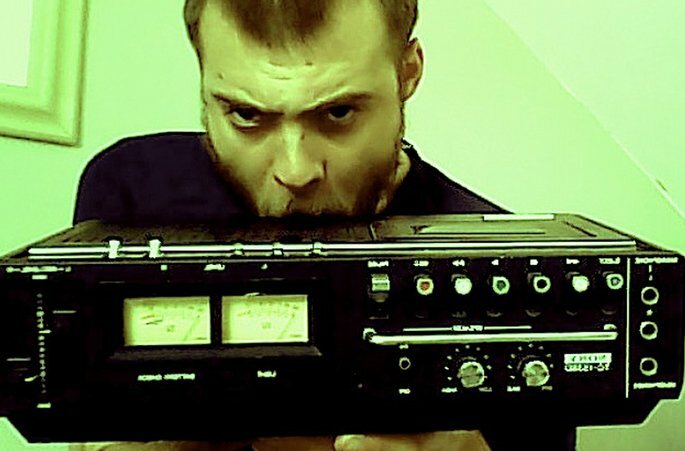 In a press photo for Louis Johnstone's latest release as Wanda Group, Ornate Circular—which came out this February on NNA Tapes—the Brighton-based UK producer appears with his jaws unhinged and wrapped around a Sony TC 153SD, one of the first portable cassette recorders. Invented in 1975, it's an unwieldy piece of equipment for the purpose Johnstone is using it for: to make field recordings of just about whatever strikes his fancy (one interview outlines a sound created by placing a contact mic in a field of grass). Johnstone's said that it gives him cuts and bruises on his shoulders when he carts it around, and in the photo, he looks ready to chew it to bits between his molars. The photo's strangely indicative of the way works as Wanda Group, making confrontational records from ground-down samples molded into a slush with a little processing and, maybe, his own saliva. Bird sounds, microphone thumps, clinking flatware, and chattering all intersect within the first 30 seconds of the tape's 20-minute first composition, "Love Inside the Ever Moving Sink." It's like the exact inverse of YouTube ASMR videos—disorienting and unsettling, as if something terrible is about to happen. Which is curious, because the component recordings are just the sounds of everyday life: there's the thrum of a lawnmower (or maybe a helicopter), and later squeaking rubber, like the sole of a shoe on hardwood. Ornate Circular, through its concrète mesh of otherwise ordinary samples, suggests that there's no reason to find comfort in mundanity. If Schaeffer and his school of experimenters sought merely to prove that quotidian rhythms could exist in musical contexts, Johnstone shows that you should fear them, that life can be a terrifying thing. On Drew Daniel and Martin Schmidt's latest release as Matmos, Ultimate Care II, the Baltimore-based duo also train their ears to domestic sources, but their assemblage of sounds from their home washing machine (the brand name of which gives the record its name) feels jubilant instead of dour. The squeak of a finger across the top of their Whirlpool machine, they discovered, can mimic the wheedle of a high-pitched synthesizer whistle, and the natural judder of a wash cycle rattles like a drum machine. Matmos say the idea struck them out of convenience—their washing machine rests just feet from their basement studio—but after looping and reorganizing the sounds, they found in it something profound. Stripped of its primary purpose, it's just a metal box that fills with water and shakes—a goofy image, as their videos for this record demonstrate. But it's also the site of a mundane ritual that we have to go through, and have gone through in one way or another for as long as humans have been draping fabric on their bodies, in order to exist in the world. Here, Schmidt and Daniel make music that's bursting with glee as effluvial as the water rushing into their machine. Rising off each shivering and shaking sample is another one—bigger, louder, more rhythmically complex, a true testament to the power that resides in the domestic. It's a celebration of the mundane tasks you have to do throughout your life, by looking at laundry from a slightly different angle and finding fun. It's something to behold. And it's dumb. And that's the point. At one moment, they present four minutes of unadulterated washing machine action, which on its face could be as base and boring as the sheer academic exercises that precede them in this field, but out of these moments are eruptions of mechanical noise and screeching metal—bursts of ecstasy and metaphorical laughter amid the thrum of Internet-era distractions. Chicago drone trio Good Willsmith's engagement with the forms of concrète skew more abstract. Natalie Chami, Max Allison, and Doug Kaplan conjure their yearning ambience mostly from looped synthesizers, guitars, and human voices, with the occasional addition of chattering prepared tapes. But concrète has traditionally been obsessed with the nonlinear treatment and editing of samples, and that's effectively how Good Willsmith treat their traditional instruments. Cosmic guitar lines are instantly looped, warped, and trashed through effects processing; Chami's voice folds into itself as layers coalesce and thicken. Ambient music is often referred to as "meditative," but this stuff truly feels like the fractured headspace you enter after spending a long time trying to fixate on nothing in particular. On the record's highest points, like the dizzy "What Goes in the Ocean Goes in You," Goodwill Smith brew a thick otherworldly stew, then swiftly shift directions. At times, they will jump into a whole other set of loops entirely, an effect like rapidly jerking a rotary dial to change between radio stations. Like Matmos, there's a playfulness to their recording, but the fluidity of their decision-making and the alienness of the instrumentals place these recordings in another realm entirely. They're using traditional instruments—at least for an ambient act—in a way suggestive of concrète structures, abstracted and alienated from their original source, and stratospheric because of it. Their forms are shifting, unpinnable, floating somewhere above the mere physicality of the samples they choose from, a brief, transcendent respite from the strains of daily existence. Pierre Schaeffer was a dreamer and theorist as much as an composer. He imagined the existence of the Mellotron—an early synthesizer-like instrument that could play back pre-recorded samples—decades before it'd be available commercially. But he couldn't have seen the full scope of the emotions that would eventually be squeezed from these techniques. What was once largely a formal and philosophical exercise has now become a means of examining the world with a closer eye, a way to love, fear, or float above the concerns of daily life, by recording its sounds and rearranging them into tapestries both terrifying and beautiful. In the midst of the constant static, the noise, and the chatter of the 21st century life, the shudder of a washing machine, a disembodied laugh, or a creaking floorboard could help you find yourself.